You don't need an arsenal of props for your wedding photos — but a sweet sign, a whimsical element, or a sentimental memento can take your pictures to the next level. Plus, if you're not entirely comfortable being on camera, a prop gives you something to do with your hands! Here, check out some of our favorite ideas from real weddings. Spell out how you feel with a sweet sign. Choose a sign that'll express your wedding-day joy. Keep it sweet and subtle with these wooden signs. Choose props that reflect your shared interests, like these cute tennis rackets. Check the final item off your list with this fun chalkboard sign. Step into your own fairy tale with this storybook backdrop. Oversized illuminated letters create a memorable backdrop for your photos. Show off your newly-married status with a simple banner. 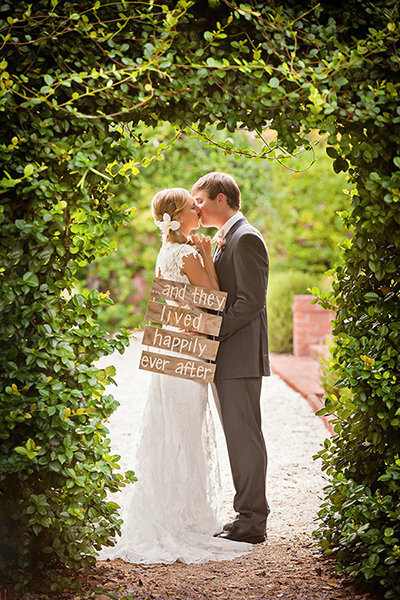 Run through a "just married" banner for a fun and memorable photo op. A heart and dot garland makes your photos pop. Twist a few twigs into a heart for a super easy prop you can make on the fly. Have your bridal party shower you with flower petals. Hold photos from your parents' weddings for a sweet and sentimental photo. Get your parents in on the fun by having them hold up signs saying how long they've been married, while you and your husband hold photos from their weddings. Honor a loved one who can't be with you on your wedding day with a meaningful photo. Take a spin on a bicycle built for two. A regular park swing just won't do; dress it up with fresh greenery and a few accent flowers. Getting married on a vineyard? Borrow a wine barrel for a sweet photo. Build even more anticipation for your first look by hiding behind balloons until the moment of the big reveal. Oversized balloons are an easy and whimsical prop. Gather all of your guests for a balloon release! Make the most of a rainy wedding day with cute matching props. Use your umbrella to channel Mary Poppins for a fun photo. Clear bubble umbrellas make this kiss photo even more sweet. Umbrellas aren't just for a rainy day; add a pop of color to your wedding photos with a bold heart-shaped version. Spell out your building blocks for a happy marriage on a set of parasols for a meaningful and memorable photo. Tell your love story with a little help from umbrellas and your BFFs. Slip on a pair of shades to add a little attitude to your pics. Place your shades in the sand and catch your own reflection. Capture your sweet sides and your silly sides in a single picture. Capture your gown from all angles with a little help from your bridesmaids. Showcase your most beloved book series with your bridesmaids. Add a nod to your favorite saga with lightsabers. Frame yourselves with this cute and easy prop. Indulge in your playful side with a colorful parachute. Have each of your bridesmaids hold up a sign describing how you two met. Feel the love with your bridesmaids. Surprise your groom with a secret message before the ceremony. Arm your bridesmaids with maracas while you sip a fruity cocktail. Add a fun pop of color with oversized pinwheels. Pop some champagne (and confetti!) with your bridesmaids. Let your groom and groomsmen borrow your bouquets for a fun photo. Go for the extreme on a snowboard. Spell out your new last name with your nearest and dearest. Celebrate your "just married" status with wooden letters. Print oversized cutouts of your bridal party members for some memorable photo ops. Take advantage of the opportunity to capture a perfect photo for your wedding thank-you cards. Get your bridal party members to help you say thanks. Surround yourselves with a ring of fire. Use a sparkler like a magic wand!